The oil and gas sector is enormously diverse, ranging from the giant exploration, production and supply companies to the manufacturers, suppliers and service providers that support an industry of crucial importance to the global community. For understandable reasons, risk management in the oil and gas sector has tended to concentrate on health and safety and environmental issues. Consideration must be made for the risks of engaging in domestic and international trade. The concept of risk and the consequential discipline of risk management underpin and support many of the fundamental activities that maintain successful trade flows. Risk management revolves around the organised procedures of mitigating the foreseen and unforeseen consequences of danger, injury and loss that can have adverse and potentially catastrophic effects on the environment, human lives, economies, political stability and business performance. Most businesses expand via sales growth often supported by the provision of credit, whereby the seller allows the buyer to pay for the product within an agreed time frame that is not immediate. Buyers may be domiciled at home or abroad and usually constitute a mix of both. The agreed credit terms may vary for each buyer and can depend on its financial status, sector, domicility and other factors. As such, the seller has fundamental risks attached in attaining growth, those being non-payment risk and the risks attached to selling to entities, public or private, in territories where political factors may have an impact. 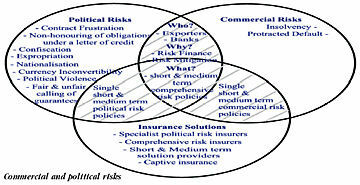 The diagram conveys that businesses are exposed to both commercial and political risks. These risks often converge, encompassing both commercial and political elements and becoming comprehensive risk. The tenor of such risks can be short, medium and long term depending on the contract and obligor. Buyers can vary and can be foreign state or parastatal in nature when political risks only will apply. Since most businesses do not engage in exports only, there is also private buyer domestic risk when commercial risks will apply. Exports will often be made to foreign private buyers when sometimes commercial risks only will apply (private buyers in stable political states) and at other times both commercial and political risks will apply (private buyers domiciled in territories where political risks may exist). Commercial risk comprises insolvency and protracted default. Insolvency is when a company can no longer meet its debts on agreed due dates and either the debtor or its creditors file a petition requesting a receiving order. Ultimately the company can go into liquidation when it is wound up by either its shareholders or directors (voluntary liquidation) or its creditors. Protracted default is when a buyer fails to meet its payment obligations after accepting delivery of goods. Many companies perceive that commercial risks do not constitute enough of a threat to justify the costs of insurance. In some cases companies believe that the sector within which they operate is suitably ebullient that risk mitigation in the form of insurance is not required. This in itself is a risky strategy. Good credit management cannot be displaced as the ultimate risk mitigant but credit insurance is a fundamental part of that process. The past three years have witnessed high publicity insolvencies and Chapter 11 filings (in the United States) of previously renowned corporations across differing sectors, including the energy sector. Similarly, many developed economies have been and continue to wrestle with economic downturn and recession leading to a manifold increase in bankruptcies and heightened commercial risk. The prudent use of credit insurance can enhance a company’s ability to withstand economic variances and exposure to distressed sectors as well as aid in the funding of the business. Policies are often required by banks if they are to discount receivables, important for many companies at all times but particularly for companies experiencing a growth phase. In its most basic form, political risk can be described as those risks pertaining to the decisions and actions of a foreign government or state and para-statal entities or from political events that can impact on the activities of exporters, importers and financing institutions. A wide variety of political risks can impact these organisations, and not all can be described in this article, but the following constitutes a range of risks considered to exist and that can be covered by political risk insurance. It is important to note that political risk coverages will cover non-payment by a government buyer and by private buyers when non-payment is caused by a political event. Import and export restrictions incorporating import and export license cancellation and the imposition of any laws, decrees or regulations that prevent import or export of relevant goods or services. Government act, law or decree where such acts prevent the fulfilment of the contractual obligations. Currency inconvertibility or Exchange transfer, when government controls prevent the conversion from local to hard currency and the transfer of hard currency out of the country. Non-Honouring of a government guarantee. Non-payment by a state buyer. War, civil war, civil strife, revolution, etc. Confiscation, Expropriation, Nationalisation and Deprivation cover, often referred to as CEND cover, is of particular importance to those companies that have invested in plant and equipment in foreign territories and could be exposed to potential loss of this investment due to the actions of the foreign government. Confiscation. Involves the seizure of a company’s assets by the host government. Expropriation. When the host government deprives the contractor of the use of its facilities, property, etc. Nationalisation. In this case the host government "officially" legislates for expropriation and assets are assigned to the state as well as transfer of management authority to the state. Deprivation. When the contractor cannot "export" its property and equipment outside of the host governments’ country and there is then potentially forced appropriation of plant, equipment and property by the host government, often leading to the contractor’s home government telling the contractor to remove its personnel from the host country. Political violence. Political violence cover is often bundled with CEND cover and involves damage to plant and equipment from political acts of violence that may include war, civil strife, etc. Unfair calling of a guarantee by a state entity or private buyer. Fair calling of a guarantee precipitated by the actions of the foreign government or the contractor’s own government. award despite the contractor receiving a judgement in its favour. Guarantee being called due to political events such as war, etc. There are a variety of inherent risks attached to trade, whether domestic or international. As can be seen above, the language used to describe these risks is fairly standard. This is because there is an active and international marketplace for credit and political risk insurance ranging from national Export Credit Agencies to private insurers. The policies that are available reflect the complexity of the risks involved and can be "off the shelf" or truly bespoke in nature. It is possible to insure one buyer, a basket of buyers or all buyers. In terms of structure, coverage can be ground-up when a small excess is applied. Increasingly for larger organisations with well-defined credit control policies and procedures, an excess of loss structure is adopted whereby coverage is triggered once a pre-determined layer of losses carried by the insured is breached. The cover could be written on a conventional risk transfer basis or where appropriate via the Alternative Risk Transfer mechanism such as captive participation. In this case the corporate insurance subsidiary would retain all or part of the risk in consideration of premium ceded. The credit insurer would then typically reinsure the captive on terms agreed between both parties. Perhaps the key point to remember is that credit and political risk insurance cannot be applied retrospectively, after an adverse event has occurred. It must be planned and put in place alongside other risk management tools.